Single fire glazing is where you glaze greenware (unfired pottery) and put it through the kiln only once. Potters have single fired their work for years and a huge quantity of ceramic items through history was produced this way. Bisque firing (and the introduction of the two-step firing and glazing process) were not discovered until much later. It’s thought the two-step process was first tried in Europe when tin oxide glazes were used. Tin oxide is not compatible with single fired work as too much damage was caused to the original pieces during the firing process, so a second firing was added. There are generally two methods of raw glazing for the single fire process. The first being where you glaze the inside of your greenware pot when it is leather hard and then the outside when it is bone dry. The second (more common technique) for raw glazing is to glaze the whole piece when the work is leather hard. This method leaves less room for error in terms of the shock to the work during the firing process. The biggest advantage to single fire glazing is that it saves both time and money. 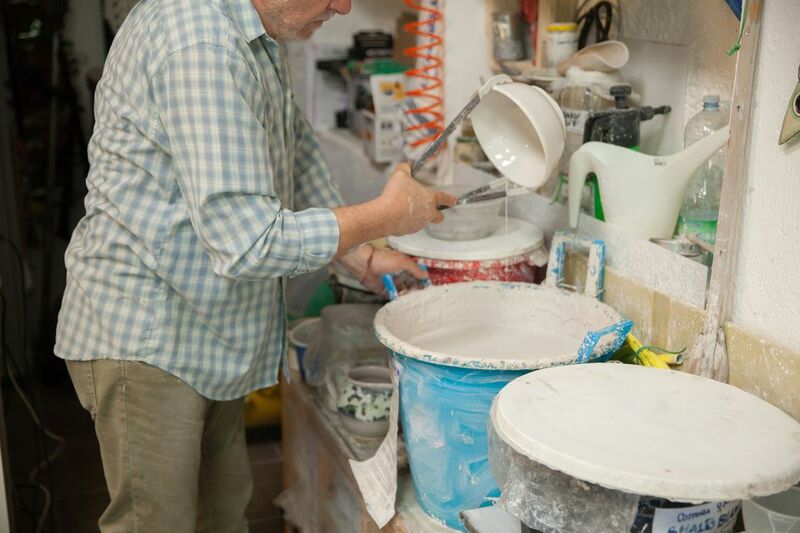 Pottery can be a lengthy process and you will need a lot of patience to get your pieces made. Firstly, you’ll spend time making your work; then it will take at least 12 hours in the kiln to run through your bisque firing. You’ll then need to glaze your ceramic pieces and put them through their second firing. Dependent on what type of glaze you are using a glaze firing can take up to two days. Firing greenware means you can do your firing and glazing in one go, therefore only having to fire up your kiln once. You can create some beautiful and unusual effects with your glazes in a single firing. Meaning you spend less time waiting until your finished piece is ready and also less power in having to fire your kiln twice. Tempting as these advantages sound, and they are pretty big advantages, you have to also consider the drawbacks of a single firing. Firstly on the disadvantages front, cracking can be commonplaces in a single firing. It’s also imperative you make sure that your greenware is completely dry before you put your glaze on and fire it, or it may explode in the kiln (this can easily happen if the temperature in the kiln rises too quickly). Your glazes also run the risk of flaking and cracking in the kiln. This is because bubbles will be escaping the clay as the firing process happens when moisture leaves the clay. If you use the traditional bisque then glaze firing, then this process will have already happened. An unfired piece of work is also, of course, more fragile than a fired piece of work, so you run the added risk of damaging your work during its handling when you put the glaze on. As water will leave the clay during the firing process, you need to make sure the clay is as dry as possible before you put the glaze on. Some potters recommend leaving the clay to dry to a bone dry level before glazing, as leather hard pieces still carry quite a high level of water content. If you are going to try the single firing method, then you’ll have to be a bit of an expert on glazes. One of the most important factors is that the glaze should contain a high clay content. The reason the glaze should have a high clay content is that the raw piece will be rehydrated by the materials in the glaze and can swell, and if there is not enough clay in the glaze recipe then it can flake off. Shiny glazes are very tricky to use for a single firing as they often have a lower clay content. Some potters use a spray glazing technique to minimize the amount of water being absorbed into the clay. This method also reduces how much you will have to handle the ceramic ware.